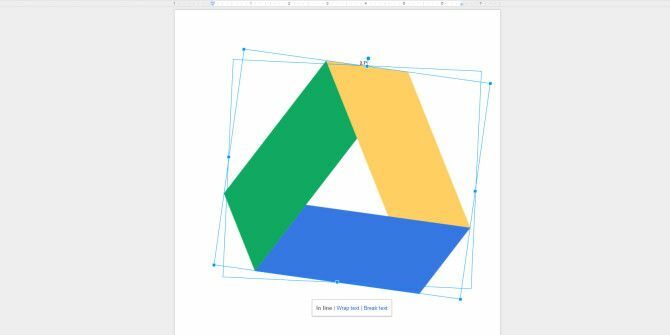 Google Docs now has basic image editing tools. It is a simple update, but it is another important step in turning Google Docs into a document editor for all seasons. The three basic image editing features now allow you to crop images, rotate the images, and add borders to “beautify” them – without falling back to another editor. The crop tool has been added to the menu. You should see something like the notification in the screenshot below. Insert an image or simply drag and drop it. You can bring up the crop handles from the format menu or with a right-click on top of the image. The top-center handle allows you to rotate the image. You can also apply borders with the Line format. It’s nothing fancy, but helps you delineate the image if need be. Masking with shapes is confined to Slides for now. Go through the simple steps on this Drive Help page for more details. The benchmark for all office suites is of course, Microsoft Office. MS Word has some handy image editing features and it will take some time for Google Docs to bridge the gap. Google took the first step by adding the primary features of cropping, shape masking and adding borders to Google Presentations Google Presentation and Drawing Apps Add Image Cropping, Masks and Borders Google Presentation and Drawing Apps Add Image Cropping, Masks and Borders Google has now turned its attention to its Presentation and Drawing apps. Since images are a big part of those, a new update brings simple image editing tools, like cropping, shape masking and adding borders. Read More (Slides). Two months later, it has come to the Google Drive tool we probably use the most. Spreadsheets may not need the feature as an essential item yet, as it is the only laggard in the group. Do the basic features save a few minutes in your workflow? Explore more about: Google Docs, Google Drive. This shows up in Presentations, but not Documents in our Drive. Why is it not showing in Documents? As you can see from the screenshots, it works just as well in Docs. It is under the Format menu.